Omni means universally available, ‘all encompassing’, and here I’m using this portmanteau word to mean ALL MEDIA, AVAILABLE EVERYWHERE TO EVERYONE. Another interesting aspect of the ZeitEYE research is that it is increasingly obvious that we are living in an integrated media-access environment, where we can quite soon expect almost instant access to whatever film, music, book, magazine, newspaper. photograph, game, database (etc) that you want. In other words we are entering an era of ubiquitous, omni-present media – access to the entire output of our culture from the last 25 thousand years. This is entirely new in the history of mankind. It is the imminent realisation of the visions of the early pioneers of informatics such as Paul Otlet (the Mundunaeum 1906-1936, Traite de Documentation 1934). This makes the British Library and Library of Congress look parochial. One of the first to realise the knowledge-storage and retrieval potential of networked computers was the American Brewster Kahle (WAIS– wide-area=information server 1991, Internet Archive 1996). Jimmy Wales Wikipedia (2001) is another recent response to this realisation of the imminence of Omnimedia. Personalisation via personal content-management systems like itunes and iphoto is another; Del.icio.us is another. Access to the entirety of man’s culture creates unique opportunities and design-problems for educationalists – not least in providing guided-tours, introductions and surveys or maps of this vast territory, or ‘media-scape’. Here we have the greatest knowledge resource ever invented – every film, every book, every journal, every TV programme, every Museum archive – do we just say to our kids ‘there it is, its up to you to make sense of it’? – or do we do what teachers have always done, that is to create reference points, canonical guides, easy-to-follow pathways, or what Vannevar Bush called ‘Associative Trails’ (Vannevar Bush: As We May Think, 1945) through this vast cornucopia? ZeitEYE I guess could provide perhaps one kind of model for these ‘omnimedia’ exploration tools. Richard Buckminster Fuller must have had something like this in mind in the 1960s when he was developing his World Game idea. Buckminster Fuller: WorldGame (1964) - a recent web interpretation of the original idea. 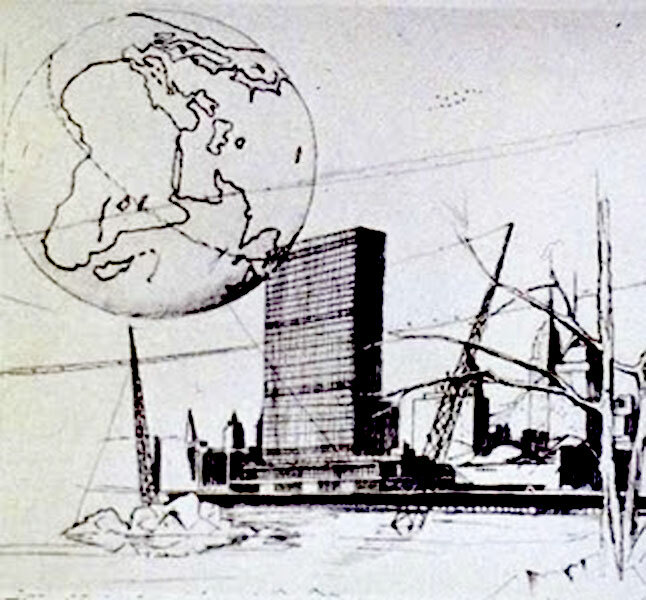 In 1964 Fuller proposed the construction of the Geoscope – a 200ft diameter transparent globe onto which could be mapped Spaceship Earth’s resources or events or populations by means of lights and computers. Smaller versions of the Geoscope were built. They were aligned with the Earth’s axis to produce a kind of natural planetarium, whereby one could view the shifting constellations through the skin of the sphere such that the stars’ positions in respect of the Geoscope would correspond with their actual positions relative to the Earth itself. Fuller intended or expected the Geoscope to be universally used as the visual reference for all hourly news broadcasts everywhere around the Earth. Further research is suggested by the form of ZeitEYE – the purposely rapid montage of stills – was first tested at different frame-rates, with 7 fps being chosen as the most viewable mean (too rapid to need a voice-over, yet just slow enough for recognition. This got me to thinking that there might be an ‘ideal’ average exposure-recognition time – or ‘cognition moment’ (see below). 7 frames per second equates to 143 milliseconds per frame. That is, in the space of one second seven frames of information are shown, which may be include textual intertitles as well as uncaptioned or purely pictorial images. So in that period you are (a) seeing an image or intertitle panel. (b) recognising or not recognising the image, or (c) reading the intertitle text. and then (d) recalling the name/descriptor/title associated with the image or (e) deciding if you recognise or understand the words on the intertitle frame (that is if they are part of your stored knowledge or not). After finishing the film, several viewers have commented that the experience is like an adrenalin-rush – and they said they got quite high watching and ‘trying to keep up with’ the film. The interest in attention, short-term, working and long-term memory first arose in the 1970s with Piaget’s comments on attention and learning (Piaget, J. (1971). Biology and Knowledge. Chicago: University of Chicago Press.) Although a decade earlier George A Miller of Princeton calculated a formula for the number of items we could hold in short-term memory – the famous 5(+/-2) – half a dozen items in short-term memory at one time for the average person (Miller, G. A. (1956). “The magical number seven, plus or minus two: Some limits on our capacity for processing information”. Psychological Review 63 (2): 81–97. (pdf)). Actually in my experience coders or computer programmers have a much more expansive short-term memory, able to coalesce dozens of parameters into coherent code. 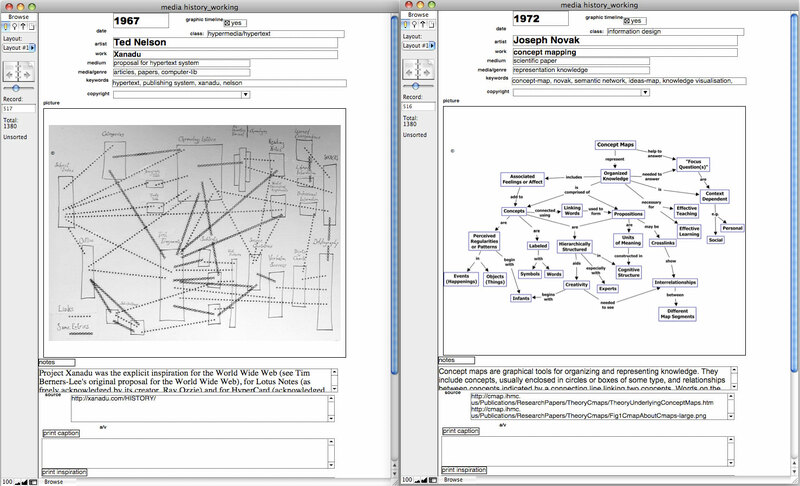 (Incidentally, this perceived limitation of short-term memory led Joseph Novak at Cornell University in the early 1970s (see http://cmap.ihmc.us/publications/researchpapers/theorycmaps/theoryunderlyingconceptmaps.ht) to develop a way of mapping memory onto paper – by using what he called ‘concept-maps’. However, later in the 1970s (Baddely and Hitch 1974) propose a different data-processing model for the brain, based on the idea of a central executive that accesses memory-regions as appropriate. The idea of a visuo-spatial scratch pad emerged – a section of the brain that would store visual information in ‘working memory’. In ZeitEYE you will have already seen about 3 more images before you have isolated and recollected the first one. The advantage here is with those who already have some exposure to (or some memory of) the subject matter – some knowledge of art-history for example. In fact the more you know about the subject matter the better you learn – the more you enjoy the film. Even some knowledge is better than none, as you build on your knowledge to accommodate new items. Apart from reading the tea-leaves or peering into a crystal ball, the principle tool of the technological futurologist is still the linear extrapolation of past developments – the projection forward of current or recent trends. Of course, the main problem with linear extrapolation is that you can’t predict the new, the surprising, the breakthrough technology, or the emergence of a new style. The other problems of this approach are to do with scope (have you missed some essential development? ); and the intrusion of the kind of personal bias that means that your strategy may be coloured by your own wishful thinking or predelictions. You can negate these problems largely by averaging the projections of many other futurologists. Another tool of the strategist is what you might call ‘creative imagineering’ – I include in this area three kinds of creativity: the creativity of engineering, the creativity of fiction, and also the insights, critiques and predictions found in the work of intellectuals – media philosophers, critics and academic researchers. 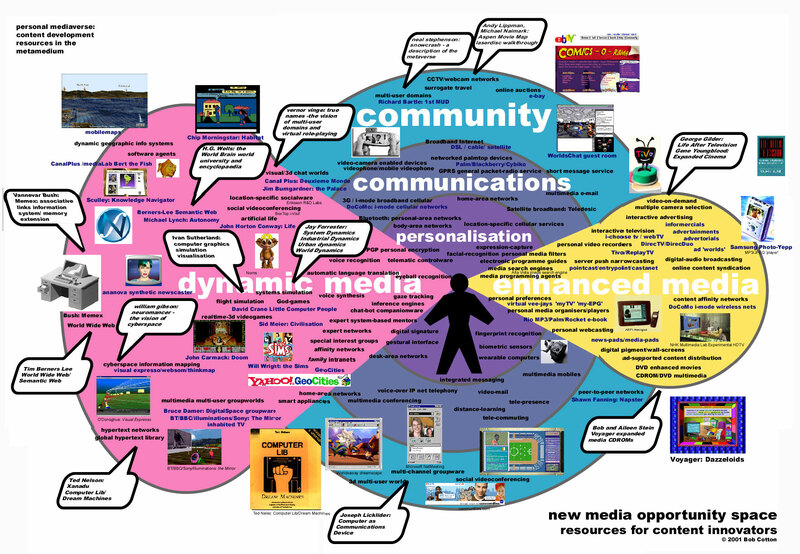 A map of the ‘new media opportunity-space’ that I designed around 2001. This was one of many attempts to visualise this emerging ‘media-space’ – effectively the new artists ‘palette’ for content innovators. Fictional ‘Imagineering’ is really important in this area– after all, it gave us the name ‘cyberspace’ itself, (back in 1983, an example of McLuhan’s observation that artists are cultural antennae, operating right on the frontiers of change. (“the artist … is always thought of as being way ahead of his time because he lives in the present”), Sci-fi writers and intellectuals have fed the imagination of digital artists and designers really since the Sixties – through the work of Herbert Marshall McLuhan, Richard Buckminster Fuller, Herman Kahn, John Brunner, Alfred Bester, Kurt Vonnegut , Brian Aldiss, – and many others. One kind of ‘imagineering’ has punctuated the history of hypermedia: the multi-disciplinary teamwork of computer scientists and engineers. Examples such as Douglas Engelbart’s Augmentation Research Centre, the Atari Research Centre, Bell Labs, the Media Lab, Xerox PARC, the Viacom New Media Kitchen, the Apple New Technology Group, and recently, the Disney Studios spring readily to mind (let alone the hypermedia research at Brown University, and work in England at Middlesex, the RCA, Central St Martins, Martlesham and Cambridge PARC. Latterly the multiple disciplines included in these commercially-funded teams have been broadened to include cognitive psychologists, telecoms engineers, AI experts, games designers, and designers and practitioners from the wide range of media disciplines that are now converging in this digital domain. These imagineering teams have been responsible for many of the big breakthroughs in human-computer interface, networking, and many other aspects of computing and digital media.
. Look at Xerox PARC: – Alan Kay with the Dynabook idea, the GUI, and Smalltalk, Bob Metcalfe with Ethernet, Larry Tesler (who went on to project manage Newton and many other products, including Hypercard, at Apple), John Warnock of Adobe, many others. Lately Michael Eisner has taken on this ‘imagineering’ mantle, creating Disney Imagineering Fellows – currently including Alan Kay, Seymour Papert, Marvin Minsky, Danny Hillis, as well as Jeff Katzenberg, George Lucas and others. Inventing the future is the best way to predict it. The other visions are expressed in fiction and as a product of the critical analysis of our techno-culture, and the work of artists and architects. Herbert Marshall McLuhan remains the constantly most surprising for me – all this stuff he wrote in the Sixties still seems to be totally relevant now, and indeed, we now inhabit the global village of his imagination. I’ve been a sci-fi fan since New Worlds appeared in the late Sixties – Moorcock’s Jerry Cornelius tetrology, and Aldiss’ Barefoot in the Head resonate from this period, and I’m a great fan of John Brunner – a really under-appreciated English SF writer – Sheep look up, Stand on Zanzibar and The Shockwave Rider – these are examples of the radical, modernist, high-tech sci-fi of this period – and they were a locus of literary innovation, reflected in these novels and in the pages of the Moorcock-edited New Worlds. These writers and many others from the States have gradually sketched a patchwork montage of the future. With the arrival of Gibson, and Sterling and the ‘Hard SF’, / ‘Mirrorshades’ / Cyberpunk genre of the mid 80’s, writers began to flesh-out more specific visions of the technofuture. Gibson quotes/ Stevenson quotes etc..
Vinge “He powered up his processors, settled back in his favourite chair, and carefully attached the Portal’s five sucker electrodes to his scalp. For long minutes nothing happened: a certain amount of self-denial – or at least self hypnosis – was necessary to make the ascent. Some experts recommended drugs or sensory isolation to heighten the user’s sensitivity to the faint, ambiguous signals that could be read from the Portal. Stephenson: “Hiro is approaching the Street. It is the Broadway, the Champs Elysees of the Metaverse. It is the brilliantly lit boulevard that can be seen, miniaturised and backward, reflected in the lenses of his goggles. It does not really exist, but right now millions of people are walking up and down it. Considering the inspirational drivers behind new media (see below), the central ideas of our rapidly developing sector have emerged throughout the last century – becoming iterations of the new world-view and of the cybernetic-electronic-robotic-cyborgian zeitgeist of our time. 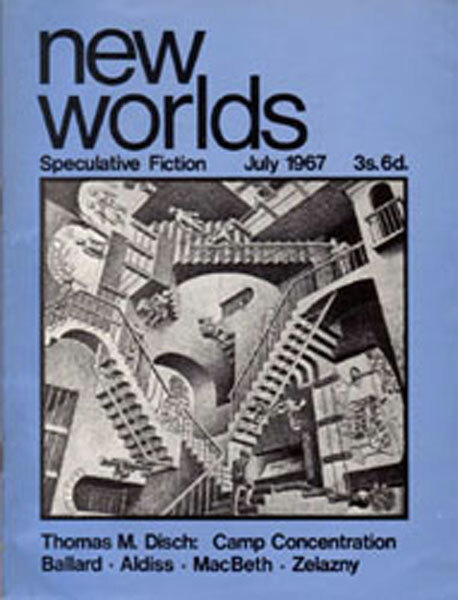 Not the least of these utopian tropes is the idea of the world library (Otlet’s Mundunaeum of 1906), H G Wells World Brain of 1936 etc) – the idea that (soon) we will have instant access to all the world’s aggregated media – the books, music, film, television, papers, journals, magazines, photographs. paintings etc…anywhere we want, instantly in realtime. We are beginning to glimpse this kind of ‘omega-point’ of instantly available information now at the end of the first decade of this century. My videos and other collections are a product of this omega-point state, and indicate a future direction for my work – exploring the event-horizon of media – the instantaneity of all media here and now, and what tools we might need to optimise our experience of this wholly new phenomena. Richard Stallman, Eric Raymond et al: Open Source (1976) – the idea that software development can best be carried out by encouraging thousands of developers/users to collaborate, developing free software that belongs to everyone. Jay Forrester: World Dynamics – the inventor of System Dynamics modelling and simulation (inspired the Club of Rome ‘Limits to Growth’ model of 1970 – that spurred the foundation of ecology and environmental pressure groups. Tim Berners Lee: The World-Wide Web (1991) – Berner’s Lee’s plan to manage millions of multi-media documents in a friendly, easily accessible hypertext network..
Vernor Vinge True Names (1981) Vinge imagining a possible future of the MUD – a multiple-User Domain invented only 3 years before by Richard Basrtle at Essex University. 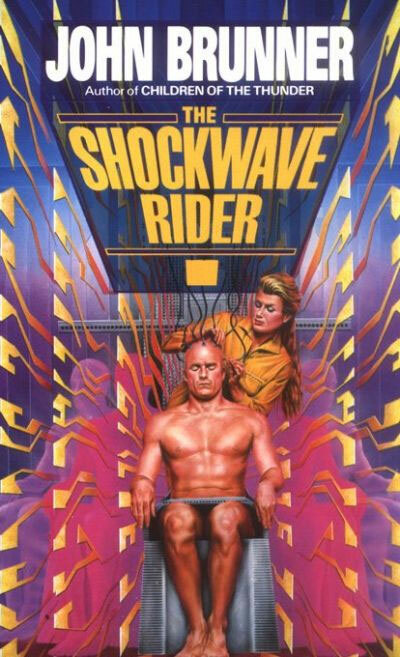 John Brunner: The Shockwave Rider (1977) Brunner’s pre-cyberpunk vision of the networked future..
Kevin Kelly: Out of Control (1991) – Kelly’s update on cybernetics, with his central theme deveoping van Foerster’s ideas of self-organisation. These core ideas (and others from Cedric Price, Roy Ascott, Jack Burnham, etc), emerging in the last century, have framed our aspirations for the future of media and its useful to see how these driving initiatives have evolved or devolved over the years, and where the indicators are for what happens next. 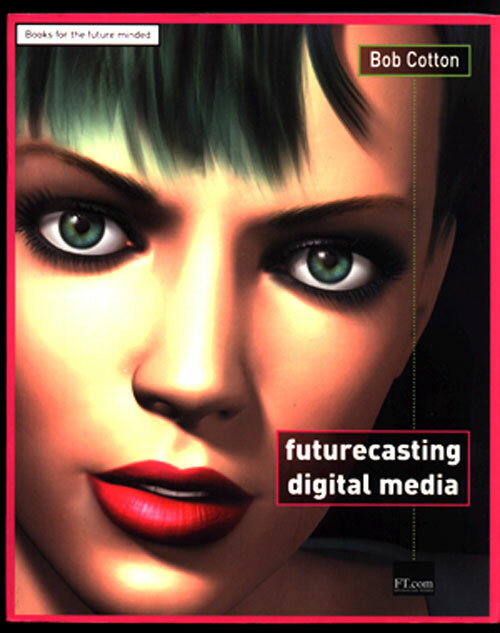 Because I’m convinced that Futurecasting – holistic technology/trend forecasting – (see Bob Cotton: Futurecasting Digital Media (2002) and Bob Cotton: The Digital Decade (Creative Review July 2003)) – is a valuable tool for innovation and design in the current highly dynamic, rapidly developing, massively networked, high-band, realtime, multimedia-matrix we live in. 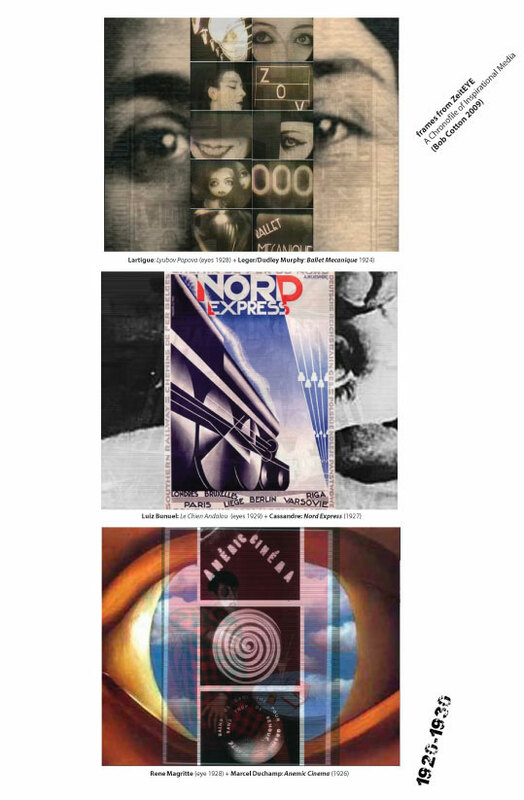 it started as a database – a database of images and hyperlinks and text collected initially to manage the writing and production of my fourth book The Cyberspace Lexicon (Phaidon 1994). it is semi-automated – images are batch-processed in Photoshop, sequenced semi-automatically in Director – and theoretically could be completely automated, perhaps apart from the initial selection of subjects and their final editing. 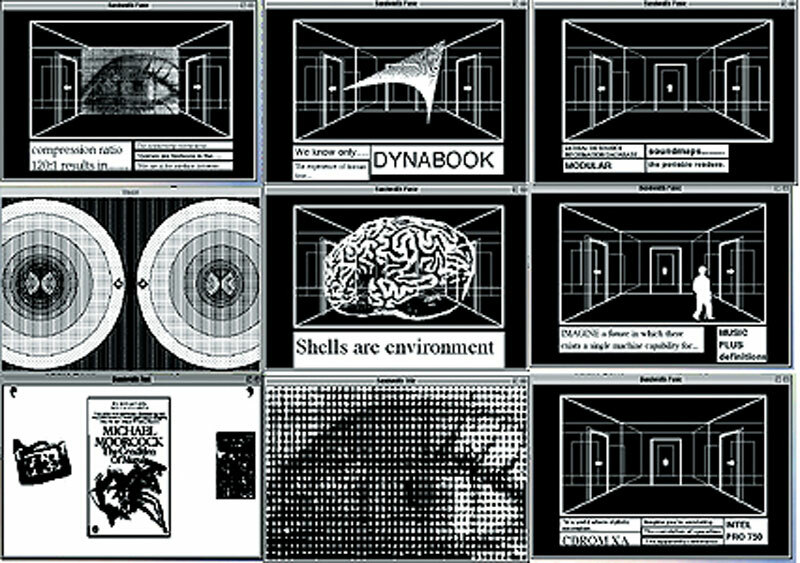 Although a linear montage animation, ZeitEYE is curiously non-linear – exploiting the delayed cognitive reaction of memory and subliminal perception, it has the effect on several viewers of triggering memories belatedly – memories that have to be refreshed by a second or subsequent viewing – a bit like serially browsing a visual database, or thumbing a flip-book. The images were collected together in a database (now comprising about 1300 items and c100,000 words), the images were batch-processed in Photoshop and imported into Adobe Director (an animation and authoring application), where they were arranged, edited, sequenced and arrayed as a rapid montage of stills, and then output to Quicktime video format. These sequences were then edited and composited with Ballet Mecanique in Adobe Premiere – a ‘non-linear’ video-editing program – and subsequently formatted as DVD or Quicktime movies. 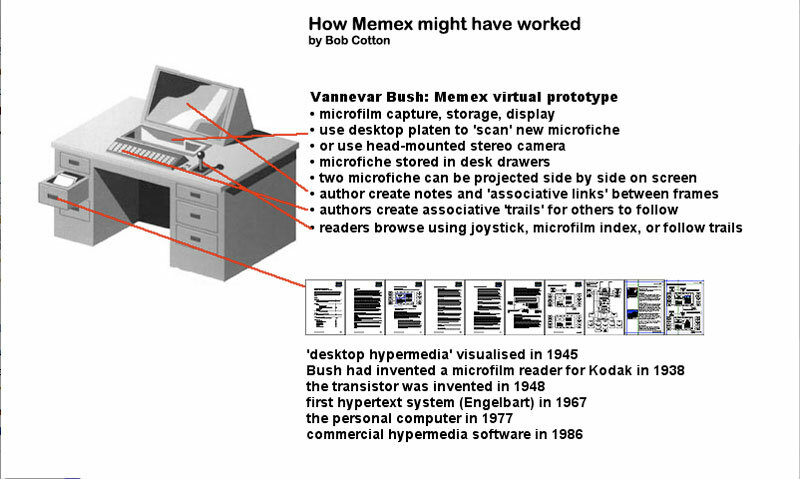 – a description of a machine for storing and linking documents (a MEMory EXtension)- which has inspired inventors ever since, including Douglas Engelbart (the mouse, 1965), the Sketchpad by Donald Sutherland (1963), Hypertext and Hypermedia (Ted Nelson 1960s), the Dynabook idea by Alan Kay (1969), Bill Atkinson’s Hypercard for the Mac (1988) and perhaps indirectly the Internet (1969-75), and the World Wide Web ((Hypertext Mark-up language 1991). So I have witnessed the last sixty odd years of these important phase-shifts in our history. It was a period that saw the development of digital computers, artificial intelligence, the ARPANET, then the INTERNET, and then the WWW, and today’s broadband networks. It saw the invention of the mobile phone, the creation of cellular networks covering much of the planet, and the development of cable television, satellite world-around television, digital television, and HDTV. And it also included the invention and development of computer graphics, computer simulation, video games and virtual reality. What’s not to get excited about? How would Diaghilev – or Wagner? – have integrated all these artists toys into a modern gesamptkunstswerk? What would El Lissitzky make of the real-world Electro-Library he glimpsed in 1925? they epitomised the period – the stars, celebrities, artists, thinkers who became iconic illustrations of their time (eg Noel Coward, Fred Astaire, Gloria Swanson, Charlie Chaplin, etc). they illustrate some aspect of the convergence of media (in terms of multimedia, synaesthesia, immersion, interactivity etc) that can be seen as the developing strands of our contemporary broadband digital media. The invention of the digital computer in the mid-20th century is of course central to these ongoing and accelerating developments. The images were collected over a period of about 15 years, and started with a lexical database created during the production of my second book on new media ‘The Cyberspace Lexicon’ (1994). The images were collected from many sources, but predominantly from the Web/Net. Many of these images are public-domain. All copyright images are the property of their respective owners. They are used here in the spirit of ‘Fair Use’ as defined in Section 10 of the 1997 Copyright Act – ie in the film they only appear for just one-seventh of a second, and they are used in a not-for-profit film, for educational use only. The music is Ballet Mecanique by the US composer George Antheil – itself a revolutionary piece deploying factory sirens, bell-ringing and other non-musical sound-effects. It is a zeitgeist composition for early Modernism and the 20th Century. It is copyright Estate of George Antheil, and used with their permission. ZeitEYE emerged out of some 15 years of intermittent research on the phenomenon of computer-mediated information and communications (or digital, interactive media), that began in the late 1980s after a decade or so of experimentation and practice with the fledgling ‘new media’ of that period. By the late 1980s I had authored computer-mediated laserdisc programmes, instructive CDROMs, and what we then called a ‘hypermagazine’ made in Apple’s revolutionary Hypercard and distributed on CDROM. This was interesting, because Hypercard was effectively a database, with individual ‘cards’ acting as data-records, but able to store a range of media as well as text, scripted interactive programs (and later video and colour graphics). High Bandwidth Panning – a hypermagazine designed by Bob Cotton, working with Richard Oliver and Asif Choudhary at the Computerr Graphics Workshop at Newham College, East Ham 2007-2008. Hypercard was the first popular and widely available hypermedia authoring and distribution system, preceding Tim Berners Lee’s WWW proposals by a couple of years (1987) – it introduced many of us to the potential of interactive media, hyperlinks, and the use of multiple media, as well as scripting in the elegant Hypertalk – a high-level coding language. 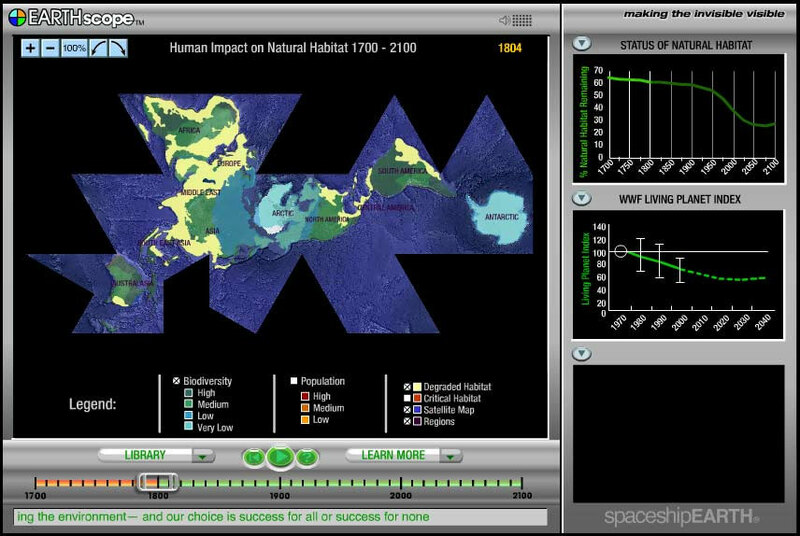 It had reasonable tools for graphics, drawing, text and typography, and animation. But then of course it was one-bit – black and white, geared to the screen-size of the early Macs – 7×5 inches (roughly 500×360 pixels). The hypermagazine we designed was called High Bandwidth Panning, and linked several ‘stacks’ of electronic cards together, covering subjects like key books on the emerging ideas of hypermedia, interactive diagrams, animated virtual rooms browsers, scripted generative computer graphics, and ideas about what kind of impact the digital media would eventually have. Sample Filemaker-Pro records from the media-history database, that has evolved from the cyberspace-lexicon database begun in the early 1990s. 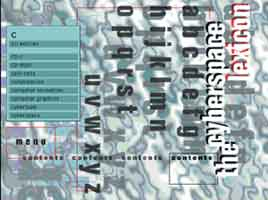 But the formalised collection and collation of digital media technologies, theories and content-design began around 1990 with the preparation of a book published by Phaidon Press in 1994: The Cyberspace Lexicon. 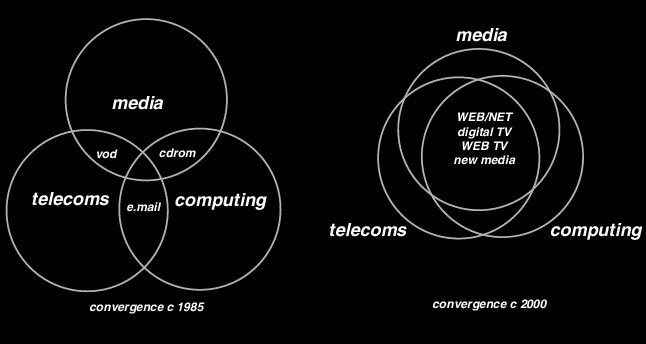 This was an A to Z of all the jargon of the emerging new media, and the previously quite separate sectors that it included: media, telecoms and computing. So I designed a database in Filemaker Pro, and I’m still adding stuff to this, it currently includes roughly 1300 items. Taking this broad McLuhanist approach to media (‘Media as extensions of Man’ – McLuhan Understanding Media 1963), and following Nicholas Negroponte’s idea of the gradual convergence of media, telecoms and computing in the digital domain (in Stewart Brand: The Media Lab – Inventing the Future at MIT 1987), as early as 1990 I wanted to map this new palette of opportunities. 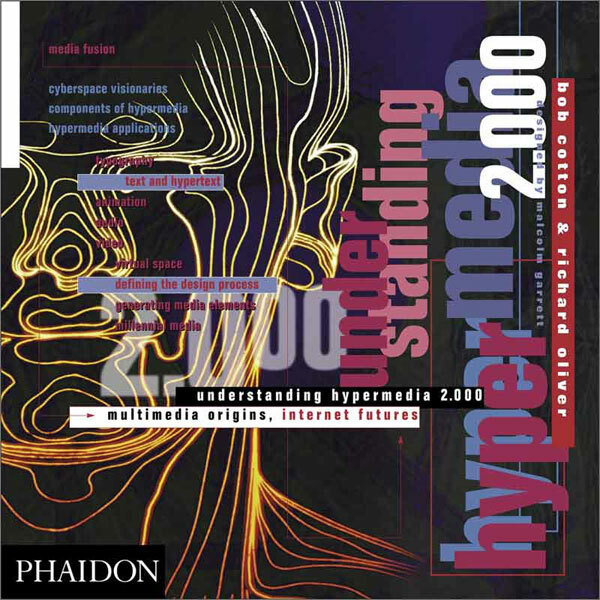 My first two books on the new media: Understanding Hypermedia (1993), and The Cyberspace Lexicon (1994) attempted this by providing overviews, with timelines and lexical treatments. 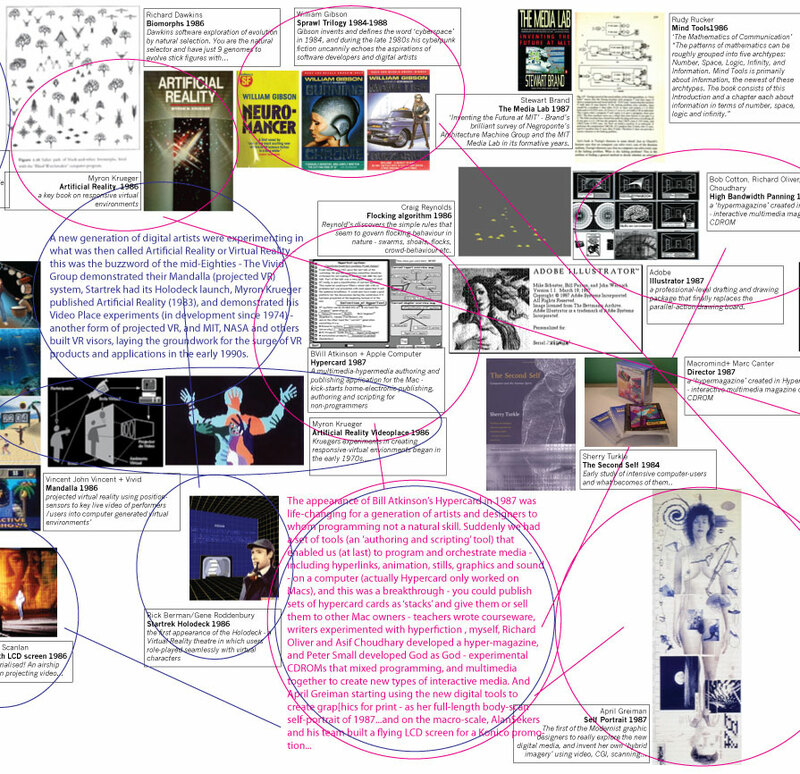 And since then, specifically at my research fellowship at LCC, I’ve been trying to illustrate the multimedia, multi-disciplinary, and dynamic nature of this opportunity-space. I wanted to illustrate this opportunity-space for students and young designers, whose idea of digital media often went no further than website-design, Photoshop and digital video. 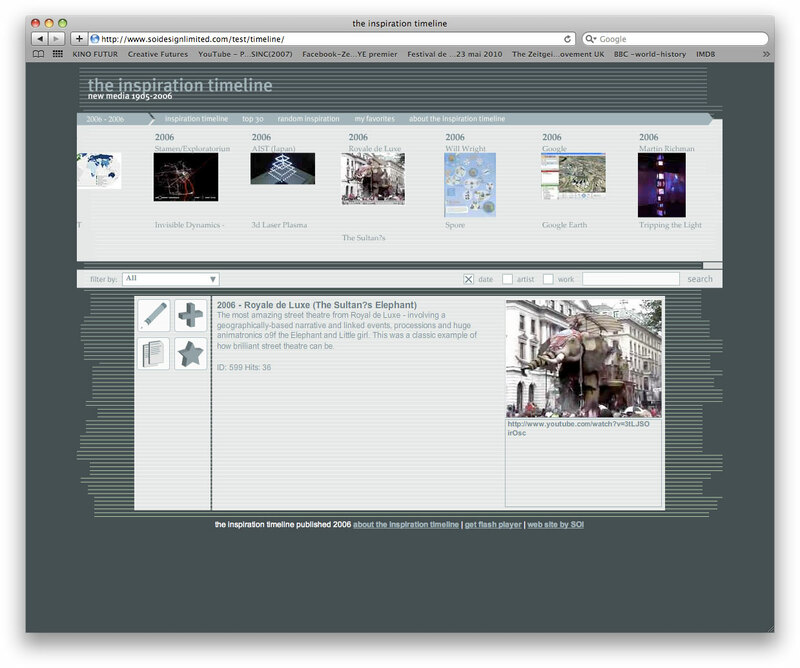 Media Innovation Timeline – the first attempt to draw all the database material together and give it an ordered form was made at LCC in 2005. This was a printed timeline exploiting the new digital printers that had emerged in this period – allowing prints a metre wide and practically any length. This version was designed and edited in Adobe Illustrator andthe output measured 36 metres x 500mm. 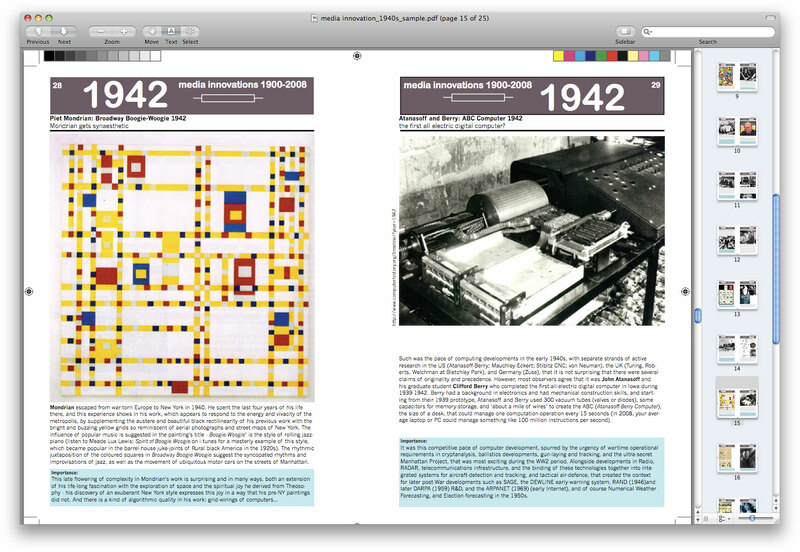 Over the last two years, I spent some time on the creation of book derived from the database – the idea was to present material in the now familiar form of one artefact per page, but after about six months of writing and editing, this proved unsatisfactory for three main reasons: the ‘print-on-demand’ technology was expensive; the clearances a major and time-consuming task; and finally and most important – the book was still a collection of individual artefacts and did not have the dynamic impact – the iconic impact that I wanted. 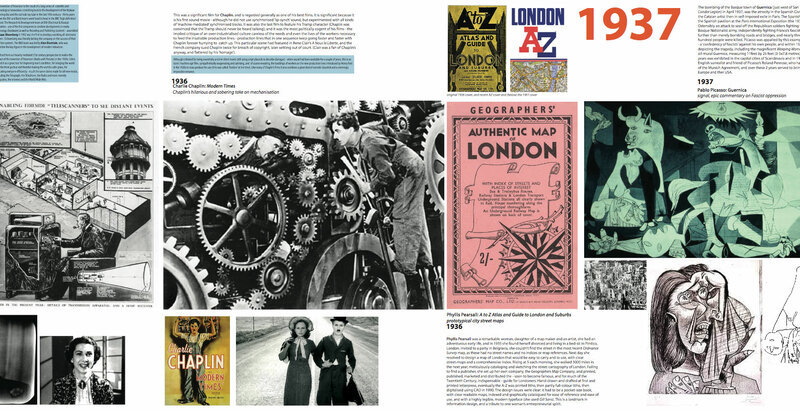 The film treatment – ZeitEYE – came about because graphic and interactive timelines didn’t seem to illustrate the scope and dynamism of the new media-space.